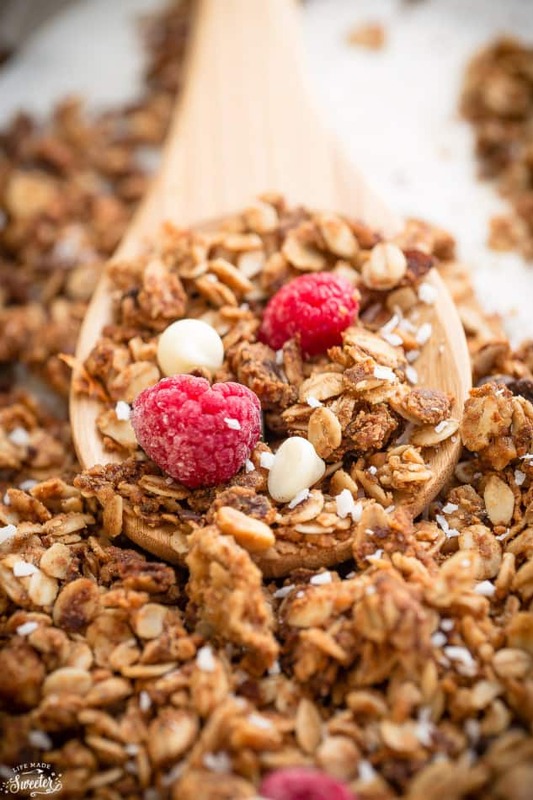 Raspberry Double Chocolate Granola makes an easy gluten free snack or breakfast. Loaded with perfectly crunchy clusters, shredded coconut, freeze-dried and fresh raspberries along with white and dark chocolate chips. 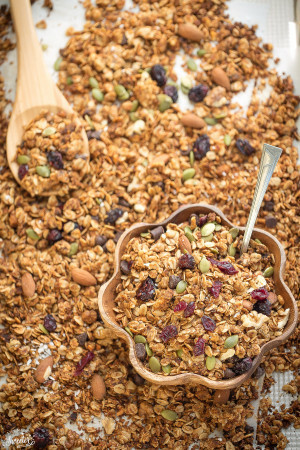 Granola is our favorite – I love making a different batch every week for me and the kiddos to snack on. They now know the familiar routine and come running to take turns adding their favorite mix-ins every time they see me taking out the extra-large mixing bowl. 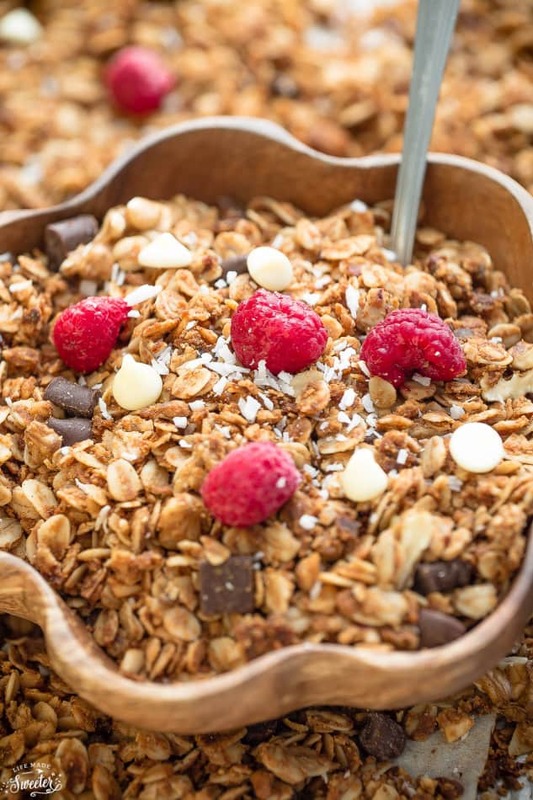 This Raspberry Double Chocolate Granola was their latest creation while dumping all the good things into the bowl. Turns out it was the best kind of accident because boy was it amazing! So we made another batch the very next day. It’s full shredded coconut, two kinds of chocolate chips and sweet raspberry goodness. With double the chocolate, freeze-dried and fresh raspberries — this is definitely not your typical granola and totally impossible to stop at just one handful! We loved that this wasn’t too sweet and the flavor combination was just enough indulgence while still being on the healthy side. Or just ditch the chocolate chips entirely for a more wholesome version. No matter which way you choose, it makes a delicious snack or breakfast served up with some yogurt or a splash of milk. 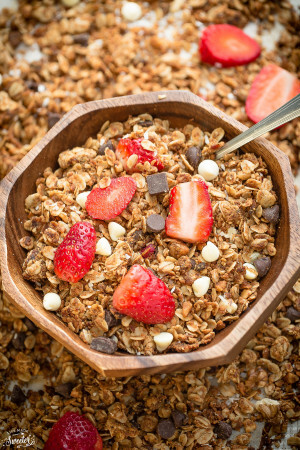 Raspberry Double Chocolate Granola makes an easy gluten free snack or breakfast. Loaded with perfectly crunchy clusters, shredded coconut, freeze-dried and fresh raspberries along with white and semi-sweet chocolate chips. 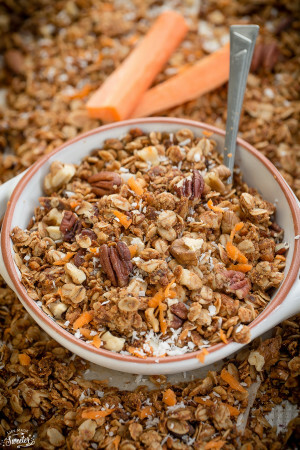 In a large bowl, combine the oats, pecans, coconut, sugar and salt. In a separate bowl, whisk together the melted coconut oil, honey and vanilla extract. Pour over oat mixture and stir until just combined and moistened. Once cool, break granola into clusters, toss in freeze-dried raspberries, all the chocolate chips and transfer to an airtight container. Serve with yogurt, fresh raspberries or fruit of of your choice.